In a forthcoming report looking specifically at teachers and administrators in Illinois, we found similar results. After digging into the data, we found that female educators on average earned 92 percent of what their male educators do. Our analysis shows that gender pay gaps exist even when narrowing in on certain roles and regardless of educational attainment. Stay tuned for more—or reach out to me at max-dot-marchitello-at-bellwethereducation-dot-org to receive an alert when it comes out. Last week I wrote about a recent report from the Democrats on the Joint Economic Committee called “Retirement Security in Peril.” In my post, I narrowed in on some flaws in how the report talked about teacher pension plans. But after thinking about it a bit more, I wanted to zoom out and focus on some of the broader trends. I'm going to show four graphs to help illustrate exactly why the "retirement security crisis" put forward by the Democrats is almost exactly wrong. 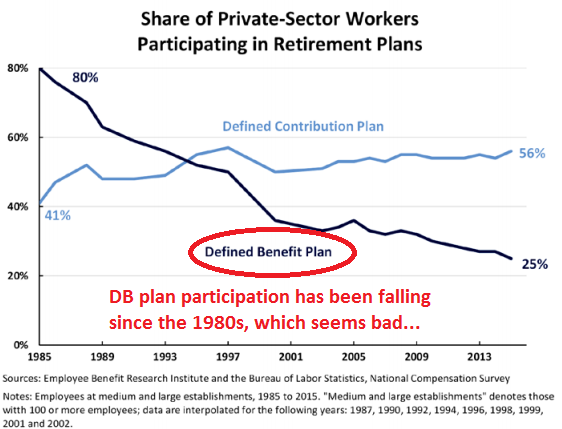 First, the graph below shows the declining share of private-sector workers who have access to a defined benefit plan. This graph comes straight from the congressional report, and I've added some crude red markings to emphasize just how dramatic this change has been. In the Democrats' telling, defined benefit plans offer workers greater retirement security, and so the decline in DB plans must also mean a decline in retirement security. This fundamental narrative is wrong--retirement plan coverage does not equal retirement benefits for workers--and as a result it's also a misread of what's happened over this time period. The next graph again comes straight out of the Democrats' report. 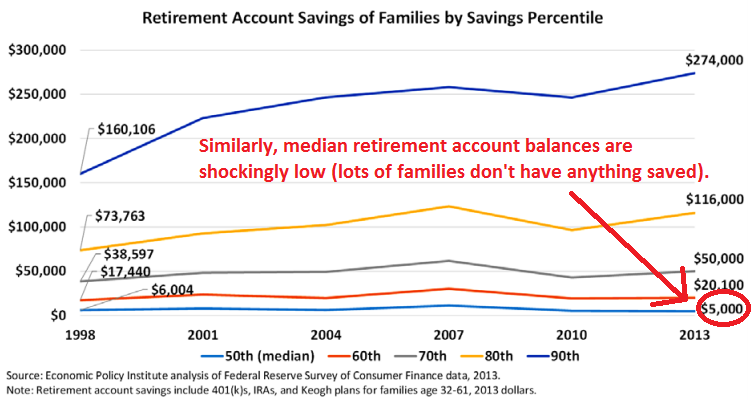 They lead with the startling finding that the median retirement savings account balance in 2013 was only $5,000 (!). That's the median, and it means most American families have nothing saved for retirement at all. That sounds really bad, and it is. But take another look at how the median has changed over time. On an inflation-adjusted basis, it dropped from $6,004 in 1998 to $5,000 in 2013. Although it's not pictured here, the same data source found that the percentage of families with retirement accounts inched up from 2013 to 2016, as did the median account balance of those plans. 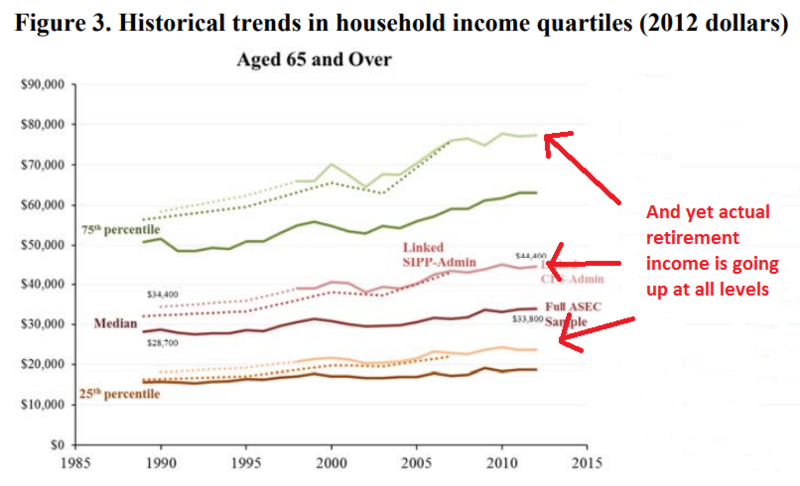 Regardless, it's hard to look at this graph and see any sort of golden age of retirement savings for American families. While things may not look great today, they never were. In fact, as I'll show in the next few graphs, things may actually be improving. To focus more on outcomes, take a look the graph below from a recent report from the U.S. Census Bureau called "Do Older Americans Have More Income Than We Think?" This graph has a lot going on, but essentially the authors were looking at two sets of data. One, represented by the dark, solid lines, shows survey data, whereas the dotted and lighter-colored lines represent the authors' more complete portrait of income using administrative and tax data. On an inflation-adjusted basis, Americans aged 65 and older, of all income levels, have more retirement income than they did in the past. That trend shows up when you ask Americans in a survey, and it shows even up more when you check administrative and tax records. These positive outcomes are occurring at the same time as fewer and fewer Americans receive defined benefit pensions. While the decline of DB pension plans certainly didn't cause these improvements, it's notable that the American retirement landscape is improving despite the changes going on across the country. In the graphs above, there are some clear trends that retirement income is increasing faster for wealthier Americans than it is for those on the lower end. But that's likely a result of increasing income inequality, and we should be careful not to equate "inequality is increasing" with "low-income individuals are worse off." In fact, consider the next graph, again from the Census report. 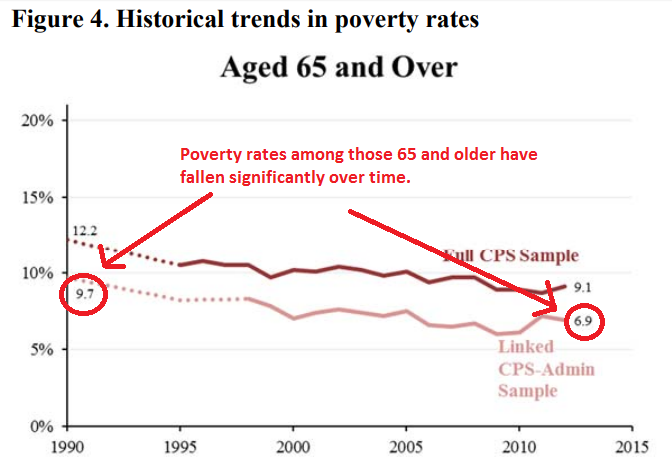 It shows that poverty rates among those 65 and over have fallen significantly over time. * Again, the survey data (represented by the top, darker line) is under-reporting the good news that shows up when the authors looked at actual income collected in administrative data (represented by the bottom, lighter-colored line). In other words, the decline in defined benefit plans has not led to a decline in retirement security. If anything, the retirement landscape has actually improved a bit over time. It's theoretically possible that it's still too soon and the next generation of retirees will suffer from this change, but by now we should have seen that start showing up in the national data, and we haven't. In fact, the trends look pretty similar even if you look at recent retirees versus those who retired 10 or 20 years ago. The "Retirement Security Crisis" has been right around the corner for the last few decades, and yet it hasn't arrived. 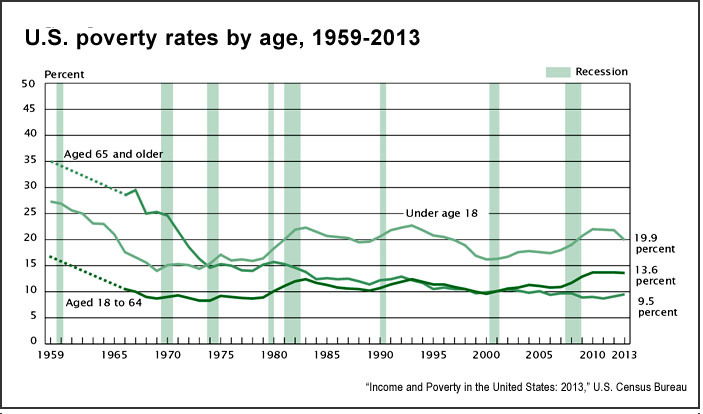 *Meanwhile, child povery rates have barely budged over this same period of time, and the poverty rates of working-age adults (ages 18-64) are actually up a bit. The benefit structure of pension systems is weird. The benefit an educator gets out of a pension fund is actually not a function of how much they contributed and the state contributed on their behalf. Instead, it is based on a number of factors, including: the age they enter and exit the system, their years of service, and their salary. That’s not how other retirement plans work. A defined contribution plan such as a 401k, produces benefits that are based on employee and employer contributions, plus whatever interest is earned on those contributions. Money out is a product of money in. In addition to the heavy back-loading of state pension systems, cross-subsidization is a big reason for so many educators earning benefits that are less valuable than their own contributions. What happens is that states’ report a uniform contribution rate, say 15 percent, with 5 percent coming from employees and 10 from employers. But no individual gets that 15 percent. Instead, the money is pooled together and awarded out via formula, and actual distributions can vary widely vary from individual to individual. And that variation tends to follow a few patterns that disadvantage newer entrants into the education profession and which favor long-term veterans. Costrell and Fuchsman find that, in contrast to the statewide uniform rate, some individuals will qualify for benefits worth 5 percent of their salary, while others will qualify for benefits worth 20 percent of their salary. They estimate that roughly one in four Massachusetts educators will be pension winners and receive benefits of greater value than the uniform statewide rate; the rest do not. In fact, a large group of Massachusetts teachers will receive pension benefits worth less than even their own contributions. How long that is the case depends on their age when they entered the profession. As shown in the graph below*, a 25-year-old entrant won’t qualify for benefits worth more than her own contributions unless she stays more than 30 years (the black line in the graph). Older entrants (purple line) become pension winners much more quickly and are more likely to receive retirement subsidies from younger and newer teachers. There are a number of reforms – ranging from relatively low-effort to completely reforming their teacher retirement systems – that states should consider. For one, they should increase transparency around contribution rates and the actual cost of benefits for individual educators. It is a problem that some teachers think they’re getting 15 percent of their salary toward retirement when in fact it is closer to 5 percent. But even that change won’t address the problem of massive unfunded liabilities that drive up the cost of pensions for educators and states. To tackle that, states should consider giving new educators the option of a cash-balance plan, or a defined-contribution plan that would, for the majority of new educators, actually provide a more valuable retirement benefit. *Source on the graph: Robert Costrell and Dillon Fuchsman, “Distribution of Teacher Pension Benefits in Massachusetts: An Idiosyncratic System of Cross-Subsidies,” University of Arkansas, Draft, February 2018, available at: http://www.uaedreform.org/downloads/2018/02/distribution-of-teacher-pension-benefits-in-massachusetts-an-idiosyncratic-system-of-cross-subsidies.pdf. Desperate times call for desperate measures, or so the saying goes. Staring down a financial crisis, Illinois is considering a fiscal Hail Mary: a massive fire sale on public debt. On Tuesday, the State Universities Annuitants Association (SUAA) proposed to the Illinois legislature a plan to fund the state’s pension system by selling a 27-year, $107 billion bond. In essence, the state would be betting they could earn more from the stock market over this period than they would pay toward the bond. While Illinois’s finances certainly are in real trouble, issuing the largest public bond in history may do more harm than good. There are a number of reasons that selling a pension obligation bond (POB), particularly one of this size, is a perilous path for Illinois. 1. It’s a gamble that state investments earn large returns. In the past, states that made this bet have often lost. For the POB to work out in the state’s favor, the portion of the bond the state invests must generate greater returns than the interest on the original bond owed to investors. This strategy could pay out, but it also could not. Remember, consistently over-estimating returns is part of the reason pension funds like Illinois’ accrued so much debt in the first place. 2. Timing matters. The moment when a stressed pension plan needs to acquire additional funds to meet its obligations is not necessarily the best time to invest in the market. The $10 billion POB Illinois issued in 2003 performed well until the market crashed in 2008. Without a significant return, a pension obligation bond can end up actually increasing debt obligations. With the stock market currently at or near all-time highs, now may not be the best time to make this sort of gamble. 3. Beggars can’t be choosers. Illinois’s finances are in shambles. The state is in desperate need of resources to meet its pension obligations and it is constitutionally prohibited from saving money by slashing benefits. The state also has a record of political turmoil and financial strife. Investors know this. It is likely, then, that potential investors will demand a sizeable premium to purchase the state’s bonds. This will further squeeze the gap between the returns Illinois earn and what it pays on the bond. In short, it’s a seller’s market, and Illinois is in a poor position to negotiate favorable terms. 4. A debt swap still leaves debt. Issuing a $107 billion POB doesn’t really change Illinois’ financial woes; it simply moves it around. The state will still carry $130 billion in pension-related debts. One issue with this strategy is that the debt tied to the POB is more rigid, and cannot be kicked down the road as states so often do with their pension obligations. Unlike the pension debt, the bond would force the state must make regular payments to creditors or risk legal action. 5.The pension system will continue to accrue debt. Perhaps the most significant failing of this strategy is that it will do nothing to slow down the rapid pace at which Illinois is adding to its pension debts. Taking out a loan to pay down current obligations – even if successful – won’t stop new debts from piling up. This strategy, indeed any approach to help Illinois deal with its burgeoning pension debts should be paired with broader retirement reforms. Given these serious concerns, issuing over $100 billion in public bonds likely is not the most prudent course for Illinois. That said, the magnitude of Illinois pension debts is such that doing nothing is not really an option. As we’ve written elsewhere, there are other strategies that states facing untenable unfunded pension liabilities can take. For example, the state could offer a pension buyout to reduce long term costs. States could also – and probably should – seek out new revenues. While I understand the urge to swing for the fences and to try and address their fiscal problems all at once, Illinois should instead seek out gradual and sustained reforms both to fund their existing pension liabilities, and to restructure their public retirement system. The state is in a deep fiscal hole, and part of getting out is to stop digging. Just How Expensive and Generous Are Teacher Pension Plans? No one disputes the question of whether today's teacher pension plans are expensive to operate; they are. Many people assume that an "expensive" retirement plans must obviously translate into generous benefits for workers, but that's not always true. If an employer contributes more money to a 401k plan, that money goes directly into workers' accounts. But that's not how most teacher retirement plans work. Under the defined benefit pension plans that cover 90 percent of public school teachers, benefits are delivered through formulas tied to the worker's years of experience and salary. Actuaries make some assumptions about how much those benefits will be worth in the future and how much is needed to save today in order to pay for those benfits, and then employers contribute the amount that's needed. That's the theory, at least, but in practice, states have accumulated $500 billion in unfunded teacher pension benefits, and so the contributions made into teacher pension plans have become more and more divorced from the actual benefits delivered to teachers. Just how divorced have contributions and benefits become in teacher pension plans? A lot! Consider the following graphs. 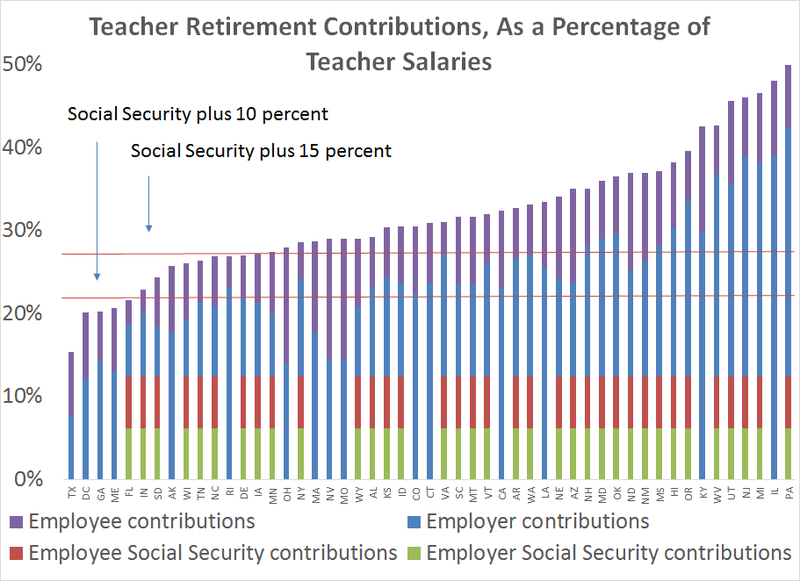 * The first graph below shows total retirement contributions into teacher pension plans, as a percentage of teacher salaries, by state. It includes the teacher's own contributions, plus the contributions made on her behalf from her district and state (which I group together as the "employer" contribution). As the graph shows, total contributions are quite high. The horizontal red lines are pegged to experts' recommendations that workers save at least 10-15 percent of their income (in addition to Social Security). Teachers in 46 states are meeting the minimum suggested threshold, and teachers in 37 states are meeting the higher savings threshold. This is how most people see teacher pension plans, because they equate "teacher pension contributions" with "teacher retirement benefits." But this story is incomplete. Pension plans today are expensive, but the bulk of the costs are going to pay down unfunded liabilities, not for actual benefits for teachers. Once we take out the debt costs that states and districts are paying, the total retirement savings start to look worse. The next graph is the same as the first, but this time I've stripped out the contributions used to pay for debt. All that's left is the contributions going toward actual teacher benefits. As before, the horizontal red lines represent the suggested contribution rates for workers to earn adequate retirement security. Looked at this way, teachers in 25 states meet the minimum threshold, but in only five states do they meet the higher target. Now, I'll pause here to note another trend. In the private sector, all employees are automatically enrolled in Social Security, but in the public sector that's been left as a choice to the states. Notice that almost all of the states meeting the savings targets are enrolling their teachers in Social Security. 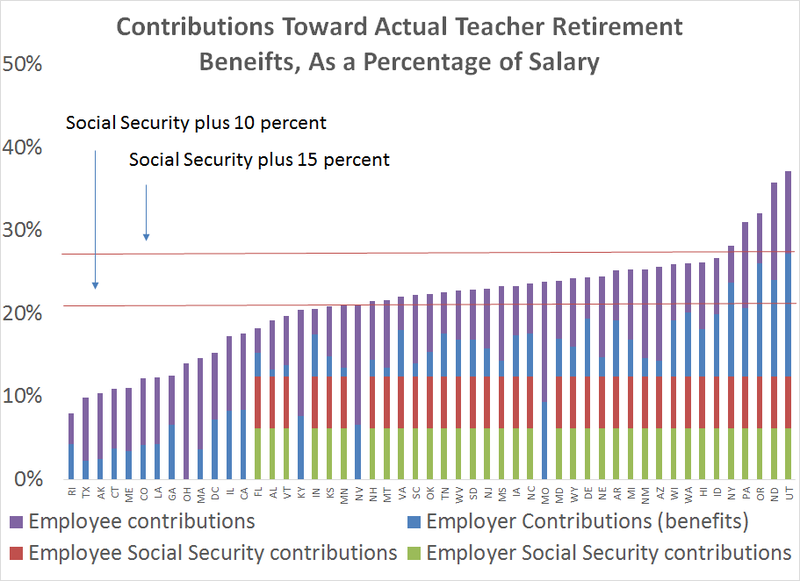 Nationally, there are about 1.2 million teachers who lack Social Security coverage, and this graph helps illustrate that Social Security provides a steady, guaranteed base of benefits that states struggle to provide on their own. There's one more wrinkle to this discussion, which is the distribution of contributions between workers and their employers. So far, I've included all contributions from any source, but what if we limit it to employers only? State legislatures set the contribution rates for both teachers and employers, and the average state is forcing teachers to contribute about 7.8 percent of their salary toward retirement. This is perhaps a good thing--workers should save for retirement, and they wouldn't all do it on their own--but it's also relevant to know how much teachers today are being asked to pay for their own benefits. The graph below looks only at the employer's share of retirement benefits. 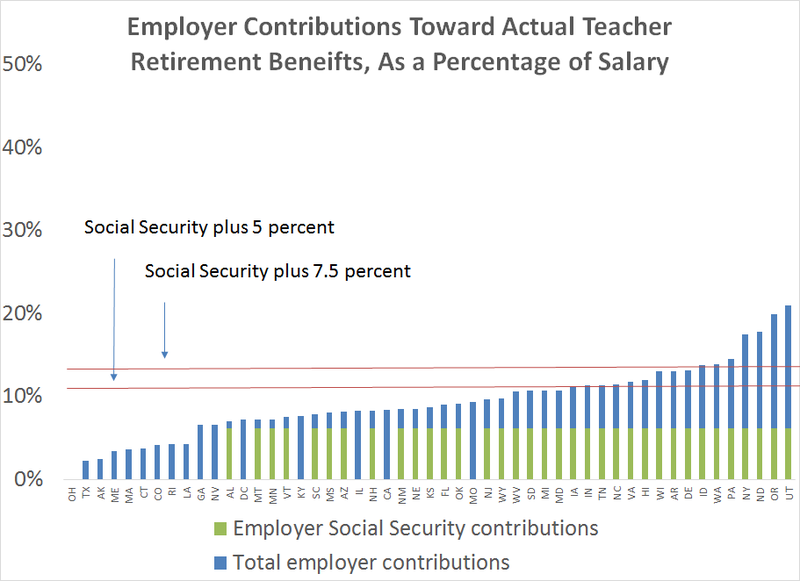 Here, I've tweaked the red lines representing the savings targets to assume that teachers and employers should evenly split retirement contributions. As the graph shows, states by and large are not holding up their end of the bargain. Only 15 states are meeting the lower-end threshold, and only seven are meeting the higher target. To put it another way, most teachers are getting less from their employer than if they worked for a private-sector company where workers got Social Security and a 5 percent match on 401k contributions. Now, some people might quibble with savings thresholds I've used, or note the findings presented here hinge on states' own investment assumptions--if we assume that states are not likely to hit their aggressive investment targets, their guaranteed benefits start to look more generous. Those are both fair critiques. But it's also worth noting that what I've used here are averages across all employees in a given state. Some workers will earn benefits that much higher than the statewide averages, while most teachers will get even less. Regardless, if states were to adopt more conservative investment targets, their liabilities would also increase, and contributions would also have to rise, and the divide between contributions and benefits would only increase. Even under current assumptions, there's no disputing that teacher pension plans are expensive, and the majority of today's teachers are not receiving the benefits of those contributions. *Note: The data for these graphs comes from the National Council on Teacher Quality.